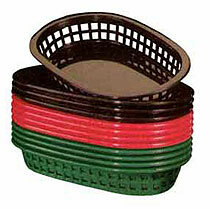 Tablecraft fast food baskets. 8-1/2 x 6 x 1-1/2 inches. Ideal for a la carte servings, such as french fries, individual sandwiches, etc. Made of polypropylene. Microwave and dishwasher safe. Ideal for children's servings. Available in Red. Set of 3 Dozen.